Specials to Offer: Receive 50 dollars off instantly with qualifying amazon visa card. In this Home theater sofa review were going to take a closer look at Seatcraft line of features to use. 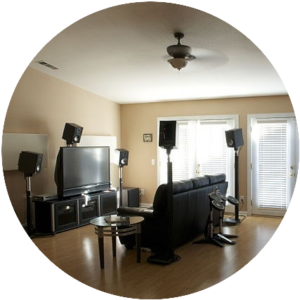 Sound shaker Amplifier: This is what makes it great to have the movie’s theater inside the living room or basement. Seatcraft added this feature to make the movie experience a lot better. Imagine having shaking and vibration sensations when each part of the movie is displaying explosions and rumbling car chases to loud crashes? This will be the game changer you have been waiting on. Tray Tables And Arm Storage: to many of us could use in so many ways and it would make those of us for sure have a good option to use in case spilling and knocking over a tub of popcorn over the floor for good measure which in my opinion has to be one the best options to have in the seat its self. If you look to store an item or two and keep it nearby you there is an option to have them placed inside the storage container hidden inside the arm rest which can help you in many ways to keep most those cluttering things out of the way. Gotta like the way its constructed to fit just inside the armrest for better concealment. Lighted cup holder and Light Base: It’s just the way things are made which shows seatcraft really took things to the next level in terms of building one the more convent ways to have a great viewing experience. No more using the lap or just holding a cup which watch the movie when you have the option to place the cup inside the cup holder and relaxing hands free while the popcorn is placed on top the tray nearby you. Adjusted Powered Headrest: It’s absolutely a great to have for difficulty watching the movie. This helps heal and sooth you’re aching back and neck and shoulders which in any case could prevent the of ache and pains of sitting for to long. All of this could be adjusted by the press of button. This is great for those of us who are very tall and could use extra space to use around the head neck. Lumbar support: To many of us have the back problems and need to have that welcome support to get the most out of this feature to use in the living room. Which in my opinion has lot of support and good posture setting features. This will get you back in better position and help you enjoy the movie twice as much. Power Recline Control Panel: It’s just about the comfort and seatcraft has mastered a way to get it too totals convince and luxury. This to me has more of a good sign to have in the home which could make things around the home help in many ways. It’s mostly Depends on your situation in terms of need of comfort for many of us have to come to terms of knowing what is needed for better comfort. These features and can be operated from the side base of the chair. Just when you thought thing can’t get any cooler than that, guess again because seatcraft has figured out a good way to used a USB port for charging your devices while you recharge in the chair in the full recliner position. Or play your favorite tune while charging a tablet for better use. It’s considered among the best in the market today, To be in this class of prestige you have to have the lines of furniture to offer to your customer fan base to give an idea to know that there is more than just simple features to use around the home. Seatcraft has a way to really getting the best out of its products. Which tends to stand to hold its on for what ever life is thrown at it. Seatcraft is made its product to accommodate the customer for years and still continues to dominant most of the market with all of these cool features. You can see why the price is quite step but the quailty is just as high as well. Would you ever considered your self in the recliner with great options to buy? At this point its up to you, Would you go for the best or roll the dice to see if you have a chance of great support and good storage only to find out its not really what you wanted in the first place. I would recommend this those who are look to give their backs, necks, and shoulder blades rest, and just enjoy the movie or just pure relaxation. It’s worth its weight in gold. If you have any questions or care to share with us your ideal opinions please feel free to comment below and leave us with any discussions you would like to have on this particular product device.